This week we ventured into spring…now it is the countdown to bikinis on the beach! Two thirds of Brits are on a diet at any one time – but now you can still have pasta, pizza and a fry up without having loads of fat, carbs and calories! 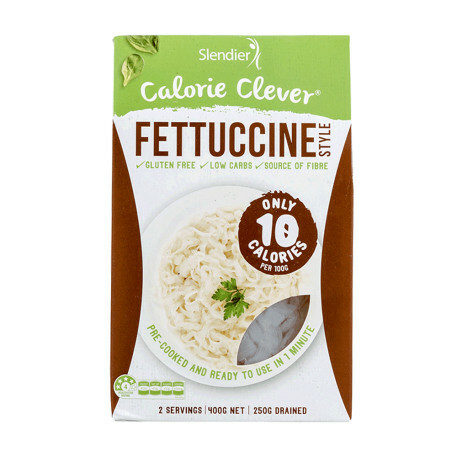 I was really dreading trying Slendier's Fettuccine. The 'pasta' comes in a sealed bag, swishing around in water and is a mixture of just water and 5% konjac – a Japanese fibre-rich root vegetable. It doesn't look appetising…at all. I snipped open the bag, drained off some pongy smelling liquid and immersed in boiling water for a minute before mixing with a tomato sauce. I was blown away. It's slightly rubbery, more bite than pasta and you wouldn't serve at a dinner party, but on a diet this is amazing. Really filling. 10kcals per serving and less than 1% fat per 100g. Imagine a pizza base that's low in carbs, gluten free, with just 39kcal and 0.5g of fat per 100g. Sounds like it will taste horrid doesn't it. The discs of 'bread' can be used as wraps, for sandwiches, tortillas etc. It is made from gluten free wheat fibre, egg white and konjac flour. Not as dense, chewy or crispy as your traditional base but its a satisfying replacement. £5 for 2 pieces, £14 for 6 pieces or £26 for 14 pieces. A sausage with just 2.5% fat is a dieters' dream. Powters Skinny Pig low fat Pork sausages contain just 97 calories each. They're infused with pepper, nutmeg, sage and marjoram plus they are gluten free. But somehow for me they don't quite cut it, they're not juicy like a 'normal' sausage, they don't give you that satisfying effect. There is a reason that Jennifer Aniston is a fan and that this facial has been knocking around for decades with only a few tweaks along the way. This 75 minute treatment promises to re-hydrate even mature skin and boost rejuvenation of cells. The therapist cleansed and exfoliated before applying a serum. She then used rollers with galvanic currents to help the serum absorb and added a specific cream for my skin before using high frequency to oxygenate. It was totally relaxing…until some much needed extraction! But afterwards there's a lovely massage and mask (where I nodded off). My dry skin felt plumper and hydrated; my fine lines visibly reduced. Affordable to book in for as a treat every few months…and I will! Anne Hathaway's favourite facial is designed to stimulate collagen production. This 70-minute treatment started with pore extraction and a skin softening peel. A brightening zinc and vitamin C solution was wiped over my face and then covered with cotton wool and an odd leather mask that looked very Hannibal Lecter! It had electric wires attached and is attached to a machine that pulses your face with galvanic currents to firm and lift. I felt an odd metal taste in my mouth but it only lasted a few minutes. My skin felt really clean and was glowing and plumped for a few days afterwards. If it's good enough for Kim Kardashian, it's good enough for me. This consists of a tiny handheld device that has 20 ultra fine 24ct gold-plated needles at one end and a container filled with a personalised treatment at the other. Dr Amit Bir Singh Sra used numbing cream on my face, put hydrating serum in the container and pushed the needles over my face so the serum penetrated in my skin. I couldn't feel a thing, the needles are thinner than a strand of hair. I only had a slightly red face for about an hour. But then my skin glowed more than it has in years and was baby soft; my make up glided on. Amazing before a big event. Will definitely have again. Portable and precise, these rollerballs will satisfy all your beauty needs while out and about. Acne sufferers praise Nip + Fab’s £6 Glycolic Fix pads for clearing up red spots – and say it works better than prescribed creams. Is stretching the new fitness trend you should try?